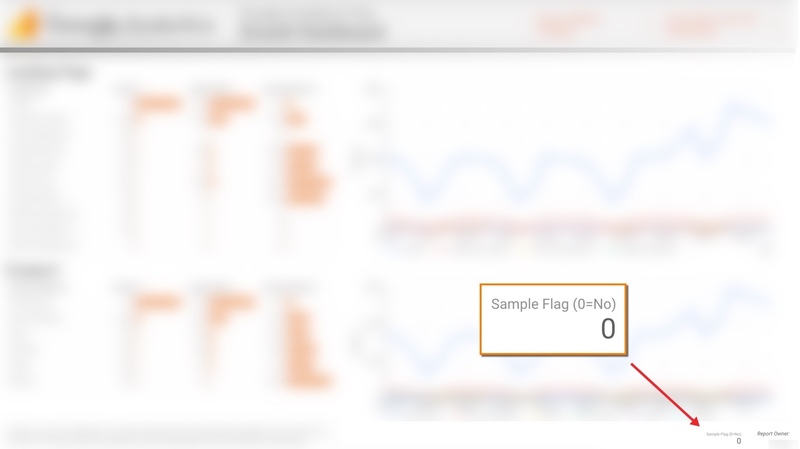 Google Data Studio “Mini Tip” – Set A “Sampled” Flag On Your Reports! Home &gg; Blog &gg; Featured, Google Analytics &gg; Google Data Studio “Mini Tip” – Set A “Sampled” Flag On Your Reports! One of my favourite things about Data Studio is the fact that it leverages an internal-only Google Analytics API, so it’s not subject to the sampling issues of the normal Google Analytics Core Reporting API. Data Studio, however, follows the same sampling rules as the Google Analytics main interface. (Yay!) Which means for 360 customers, Data Studio will not sample until the selected timeframe is over 100M sessions. 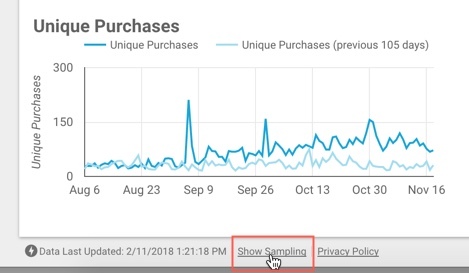 But here’s the thing… In Google Analytics’ main UI, we see a little “sampling indicator” to tell us if our data is being sampled. In Data Studio, historically there was nothing to tell you (or your users) if the data they are looking at is sampled or not. Data Studio “follows the same rules as the UI”, so technically, to know if something is sampled, you had to go request the same data via the UI and see if it’s sampled. What I have historically done is add a discreet “Sampling Flag” to reports and dashboards. Now, keep in mind – this will not tell you if your data is actually being sampled. (That depends on the nature of each query itself.) However, a simple Sampling Flag can at least alert you or your users to the possibility that your query might be sampled, so you can check the original (non-embedded) Data Studio report, or the GA UI, for confirmation. Keep in mind, if you have a report with multiple GA Views pulled together, you would need one Sampling Flag for each view (as it’s possible some views may have sampled data, while others may not.) If you’re using Data Studio within its main UI (aka, not embedded reports) the native sampling toggle may be more useful there. I hope this is useful “mini tip”! Thoughts? Questions? Comments? Cool alternatives? Please add to the comments!